The study aims at regional and probabilistic evaluation of bivariate drought characteristics to assess both the past and future drought duration and severity in Bangladesh. The procedures involve applying (1) standardized precipitation index to identify drought duration and severity, (2) regional frequency analysis to determine the appropriate marginal distributions for both duration and severity, (3) copula model to estimate the joint probability distribution of drought duration and severity, and (4) precipitation projections from multiple climate models to assess future drought trends. Since drought duration and severity in Bangladesh are often strongly correlated and do not follow same marginal distributions, the joint and conditional return periods of droughts are characterized using the copula-based joint distribution. The country is divided into three homogeneous regions using Fuzzy clustering and multivariate discordancy and homogeneity measures. For given severity and duration values, the joint return periods for a drought to exceed both values are on average 45% larger, while to exceed either value are 40% less than the return periods from the univariate frequency analysis, which treats drought duration and severity independently. These suggest that compared to the bivariate drought frequency analysis, the standard univariate frequency analysis under/overestimate the frequency and severity of droughts depending on how their duration and severity are related. Overall, more frequent and severe droughts are observed in the west side of the country. Future drought trend based on four climate models and two scenarios showed the possibility of less frequent drought in the future (2020–2100) than in the past (1961–2010). The online version of this article ( https://doi.org/10.1007/s00704-018-2407-7) contains supplementary material, which is available to authorized users. This study was supported in part by the Department of Defense under contract W912HQ150023. H. Li also acknowledges the support from the Office of Science of the U.S. Department of Energy as part of the Regional and Global Climate Modeling Program. 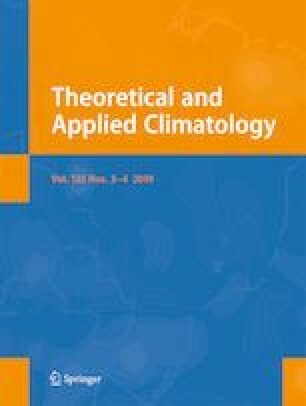 Climate scenarios used were from the NEX-GDDP dataset, prepared by the Climate Analytics Group and NASA Ames Research Center using the NASA Earth Exchange, and distributed by the NASA Center for Climate Simulation (NCCS).